Website with over 3,000 entries including information on prominent Methodists from all ages, pre-1932 Methodist groups, many Methodist Churches and Circuits, Theological colleges and Methodist organisations. Collections of institutional and personal records relating to Methodism, and a range of libraries that contain collections of material. A guide to all the books you can now read online in the comfort of your own home, rather than have to visit a library. 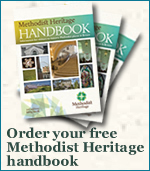 Methodism has been the subject of doctoral research by quite a few scholars.